Belt sanders with 13 x 451 sanding belts are categorised as file sanders which are designed specifically to tackle tough jobs where the material, or the location of the material is hard to sand. 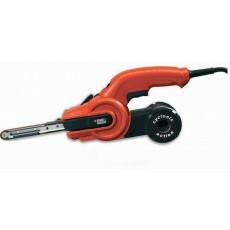 Some surface shapes or areas that would normally need to be sanded by hand can be tackled with this type of belt sander. Builders and carpenters may often use a file sander to save both time and effort. The key consideration with selecting a belt sander is the belt size. This particular dimension of belt is useful for sanding of pipes & into confined spaces.